« Whois Privacy and Why It Matters. Once an address has been whitelisted, the sender will not be asked to confirm they’re an actual person. Most customers who have been using BoxTrapper have found that the level of spam being sent to their account has decreased since initially setting it up. Carefully read the instructions on this page for how address needs to be formatted. You can filter addresses be sender, subject, cc, etc. As an example, to filter mail from the address john.smith@domain.com, you would add a line “from john\.smith\@domain\.com”. You’ll notice you need to have a backslash in front of the at sign and periods. All mail that has been trapped will be displayed in a table. Review the queue first for mail that you think is not spam (if any), and select these messages, click the radio button next to Whitelist and Deliver and click the Submit button. For the remaining spam, click the selection box at the top left (above where mail is displayed) to select all messages, click the radio button next to delete and submit. Click Go Back and then the link to review the previous day’s trapped mail. With BoxTrapper, you only need to log in and spend a few minutes or less per day to review trapped mail and delete the spam. If you have notices that pop up on your desktop to notify you you have new email, spam will no longer trigger this distraction. 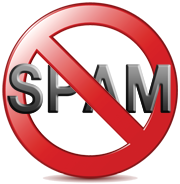 Previously, we have posted a guide to setting up spam filtering based on the subject of the email being received, and included in this post a sample spam filter you can upload to your account. You’ll find this post under this link. If you find this post useful or have other ideas/topics you’d like to see in this blog , we’d love to hear from you. This entry was posted on Wednesday, May 7th, 2014 at 5:16 pm	and is filed under Email Hosting. You can follow any responses to this entry through the RSS 2.0 feed. You can leave a response, or trackback from your own site.